Thank you for your interest in Audio Monitor. Please complete and submit the form below and an ADInstruments representative will aim to get in touch within one working day. If you’d like to speak to someone immediately, office contact information is available from the contact page. Ideal for the classroom, the audio monitor allows students to use audio rather than visual cues in neurophysiology laboratories. 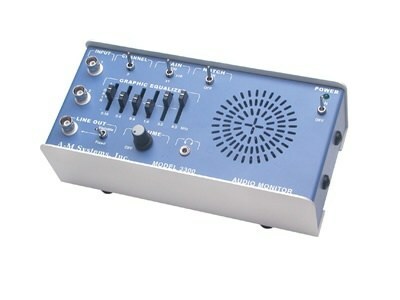 The audio monitor features a built-in 6-band audio equalizer that enables the user to tailor the audio performance to their personal satisfaction, a high-fidelity quality speaker, a dedicated notch filter designed to minimize noise interference generated by power lines, a headphone jack and a BNC line out jack. The instrument can be placed on a lab bench with its built-in metal stand. The monitor is ideal for the classroom, allowing students to use audio rather than visual cues in classroom neurophysiology measurements. It can be used with the Neuroscience Kit.